The toys are back in town – and they're looking slicker than ever. Hold onto your cowboy hats Toy Story fans, there's a new film in town. That's right, today saw the release of the first proper trailer for Toy Story 4. Over the last few months Disney and Pixar have been building up anticipation by leaking previews, teasers and new characters, but now we've got our first proper glimpse of what to expect. The trailer, which has already got vloggers posting their reaction videos, promises a story that's cast in the same mould as the previous three films. So this means laughs for all ages, a thrilling plot, and an existential crisis over what it means to be a toy. And if it's anything like Toy Story 3, you might want to bring a tissue to the cinema to dab away those tears. However we can't help but ask... does the series need a fourth instalment? The original Toy Story trilogy includes some of the best moments to be found in 3D movies, such as the first time Buzz falls with style, to the suspenseful slide towards the incinerator. Where can the franchise go from there? By the looks of the trailer though, it seems that Toy Story 4 is aware of this because it's all about what happens after you think the story has been told and the surprising directions life can take you in. Bo Peep's back too, so that's cool. Check out the full length trailer below. 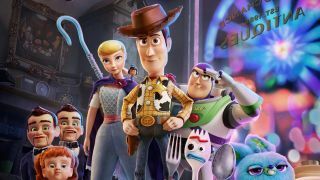 For readers who grew up with the original films, the trailer for Toy Story 4 is sure to make you feel nostalgic. After all, it's been 24 years since the first Toy Story film was released. A lot has changed in that time, but it's comforting to see that Woody and Buzz have still got each other's back. It's also fascinating to see how far 3D animation has come. Pixar was very clever when it chose toys to be the lead characters way back in 1995 because they lent themselves well to the capabilities of the animation software of the time. Since then it's treated audiences to furry monsters and incredible superheroes, but only with Toy Story can we fairly gauge how sophisticated Pixar's animation technology has become. We were particularly impressed with the surface textures in the Toy Story 4 trailer. Just look at the way the light shines off Little Bo Peep's porcelain face. The characterisation of humans such as Bonnie has also come on leaps and bounds. In the first film the human characters were a little too uncanny valley, but now they look just as endearing as the toys themselves. See for yourself how much 3D animation has improved by watching the trailer for the first Toy Story film.